1. 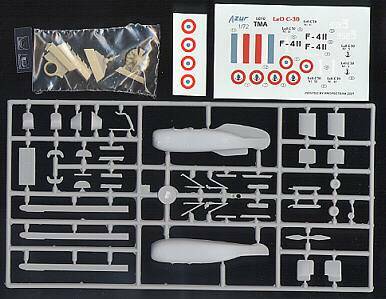 Although it appears to have been released over two years ago, I have only just discovered that the Azur Cierva C.30 kit #72015 (HKN #117) was also issued in France in a special LeO C.30 edition. The kit is a Azur + TMA production, and differs from the regular issue in that it has a new decal sheet and a resin Salmson engine instead of the C.30 Genet engine. It should also use the spare tail-plane parts that were in the original issue. This kit is still available, one on-line source is Kits Discount. TMA is a modelling and aviation business in Paris who are also publishers of Air Magazine, issue #3 of which featured the C.30 and particularly the LeO C.30 and C.130 variants. And hot off the TMA press is a new book, "Les Autogires La Cierva" by Jose Fernandez, Juan Arraez Cerda, and Arnaud Prudhomme. 2. The latest release from Sharkit is their 1:48 Avro Canada Avrocar VZ-9. 3. Revell's 1:144 CH-53G 'Camouflage' #4011, was released in January. Not surprisingly this contains the same 64 plastic parts as their 1995 issue #4065 CH-53G (30 Jahre Heeresflieger Mendig). The differences are in the paint scheme and the decal sheet. The colours are the 3-tone 'norm-84' camouflage of RAL 6003 Olivgrьn, RAL 7021 Schwarzgrau, and FS 34079 Forest Green. As usual the instructions do not give you the reference numbers for these, only giving recipes for their usual proprietary colour mixes. They even tell you to mix up the olive green from two other colours despite the fact that they sell RAL 6003 in one tin themselves! For more information on RAL & RLM colour charts and paint matches, and to buy authentic German paint mixtures, visit Don Color. Markings are provided for 84+06 and 85+03, both from HFR 15 based at Rheine-Bentlage in the summer of 2000. These have combined HEER and KFOR titles. While Revell's paint policy is irritating, their decal sheet is amazing for a 1:144 model. 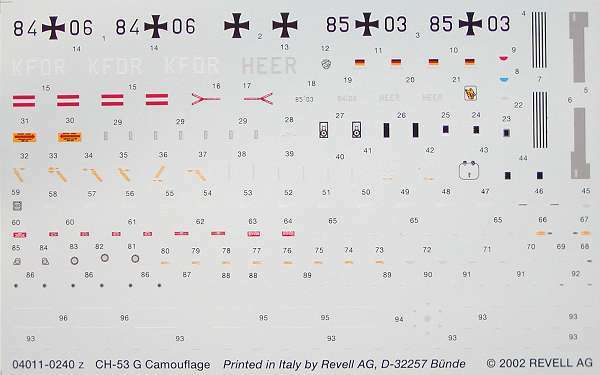 It has about 176 separate decals, including for example two different sets of main and tail rotor blade stencils for the two aircraft (the differences only evident under a high-magnification lens). On the example examined here the colours are slightly out of register, but this is only evident on the yellow/red/black German flag fin flashes, and easily remedied by careful trimming. There are excellent pictures of all three and many more at Helionline.de. 5. In 2003 the Airfix 'Modern Aircraft Collection' series will include #98099 which is a set of three kits, the 1:72 Kaman Seasprite # 03041 (which was discontinued in 2001) and a couple of so far unidentified USN jets. 6. Hasegawa's 2003 programme includes yet another version of their 1:48 Apache. This time it's the IDF/AF 'Peten', #09489, due for release in the second quarter. 8. 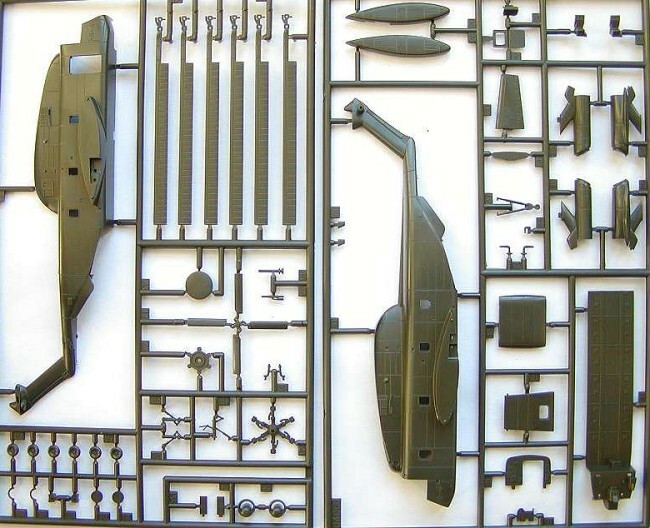 There is an unconfirmed rumour that 'Russian Project', maker of the multimedia 1:48 Mi-8, are now working on 1:72 Mi-6 and a 1:72 Mi-10 in a similar selection of materials. 9. FE Resin have produced a 1:144 AH-1G Cobra, #144009, available online from Hobbyshop.cz. This reminds me to mention that Two Bobs have now sold out of their 1:35 AH-1W decal sheet and the 1:48 version is almost gone too, so if you still need either of these you had better be quick. Flightdecs still have a few. 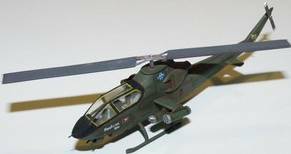 - AH-1W Cobras at war, including Operations Desert Storm and Enduring Freedom. GG72-??? USS Peleliu at War! - USS Peleliu LHA 5 (15th Marine Expeditionary Unit), Operation Enduring Freedom. AV-8B Harrier, AH-1W Cobra, CH-46 Sea Knight, UH-1N and CH-53 Super Stallion, including mission markings, artwork and mission information. 13. 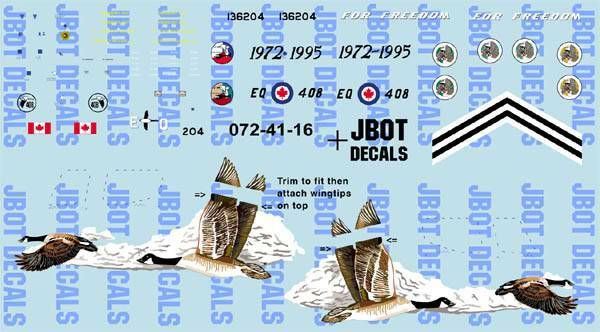 JBOT has completed his intricate CAF 408 Squadron "Goose" retirement scheme decals. They are now available to order in virtually every scale imaginable. There should be a review in the next issue of HKN. Also now available from JBOT are decals for a Greek Air Force Schweizer 300 trainer in an eye-catching orange. "From 1954 when first helicopter were introduced in Yugoslav Air Force and other government and civil forces until today there was a lot of models in use. They were especially used during conflicts and wars after the split-up of "second" Yugoslavia when we had some very interesting markings and coloring. We will try as much as possible to put on this decal set large and colorful selection." 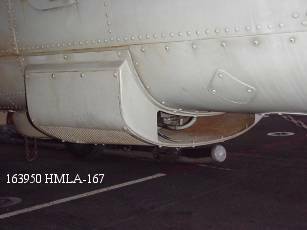 C-014 1/72 Mil Mi-24 Hind wheel bays. This has 11 resin parts to replace the wheel wells and undercarriage in the Italeri kit. 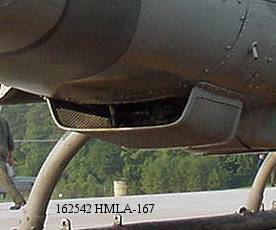 C-015 1/72 Mil Mi-17 Hip-H. This has 14 resin and 44 photo-etched parts. 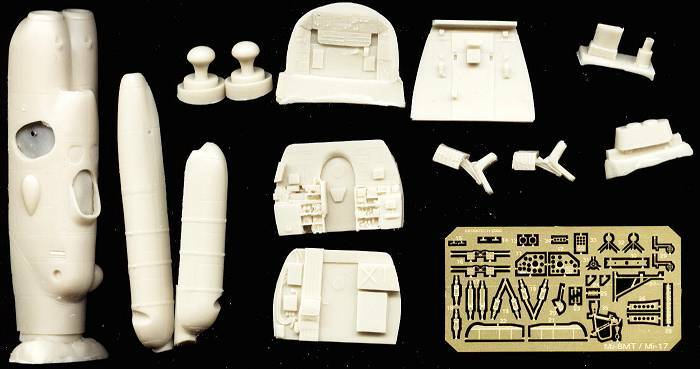 Ciro say "The set contains resin and photo-etched parts for making detailed interior and for correction of the badly done parts of KP model (the right shape of the engine/gearbox/APU cowlings, new fuel tanks, DISS-15 Doppler navigation system box and winch)." As far as I can see the 'corrected' vacform canopy is not included. Refer to the Ciro website for a discussion of their plans to adapt their Mi-8/17 sets where necessary to fit the Zvezda kits. 17. Those who've bought Steven Coates' 'Helicopters of the Third Reich' may be interested to learn that a 'source pages' supplement is now available for download, so you can print it out and slip it into the end of your book. 18. There is a new link on the links page, to Philippe Dognon's unusual and fascinating collection of helicopter patches, currently featuring US Navy & Marines Squadrons, with much more to come. And anyone who is interested in collecting helicopter picture-postcards should visit Petr Zaoral's new Helicopter Postcards Reference Page. Thanks to Gary Webster (GermanVTOL.com), Randy Smith (USMC), Jens Popp (Don Color), Jim Botaitis (JBOT Decals), George Filyagin, and Philippe Dognon (Kits Discount).